Betty lets the young foxes play with a box of her old dresses. The foxes are depicted laughing while wearing Betty’s brightly colored, out-of-style, but very fun clothes. The text reads: “Vincent loved dressing up more than anything in the world, because he could use his imagination to be anything he wanted to be.” Vincent is seen pretending to be a queen and a witch, two images of strong, powerful femininity. In fact, Vincent always pretends to be a girl, a point his brothers and sisters eventually bring up. Vincent is not sure how to respond when asked why he prefers girlish costumes. He goes off by himself to think about it. While reflecting deeply about his gender identity he realizes he is happiest when he can look and act girlish. He does not immediately share his thoughts with anyone, but the next day Betty the Badger is able to coax him into conversation and he confides that he thinks he is a girl. Betty calmly nods and shares a story with him. Her story begins: “‘When I was a young badger I loved playing make-believe with my sisters, just like you. I was also a boy badger, just like you.’” An image of a young Betty the Badger in too-big heels reminds the reader of Vincent the Vixen’s dress play. Betty also explains that she felt like a girl, just like Vincent. She says that when she told her siblings they were confused at first but grew to understand. Even more, Betty tells Vincent that she was and is happy with her decision. Later that night, Vincent tells his parents that when he dresses-up he is not really playing make-believe, he is not pretending to be a girl, he just is one. Like Betty’s siblings, Vincent’s family is confused at first, but they quickly accept that she is a girl. The theme of young boys “dressing-up” in girl’s and women’s attire has been explored in many texts since Cheryl Kilodavis’s 1999 children’s picture book My Princess Boy. Reeves takes this theme in a new direction in a book even very young readers will be able to understand thanks to clear images and straightforward prose. Unlike most texts, which assert that boys playing dress-up are really boys, Reeves introduces a character who really isn’t. Both representations are needed, because they reflect the multiple realities of children. Reeves focuses on self-awareness and self-acceptance as well as family support. 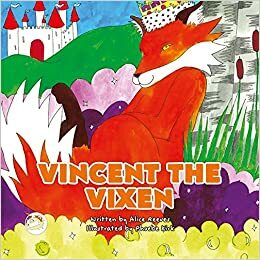 She treats her young character with dignity; of course, Vincent the Vixen knows her own mind. This text is a needed contribution to LGBTQ* children’s literature. The inclusion of an adult transgender character able to help Vincent the Vixen reach self-awareness in a positive way is critical to conversations about LGBTQ youth who frequently grow up in cisgender heterosexual households where a lack of common experience, regardless of the best intentions, can lead to feelings of isolation. This is an impressive text that accommodates even the youngest readers while introducing important ideas into the emerging canon of LGBTQ* children’s literature.